And then comes the race report….so apologies while I indulge myself…you might want to sit down with a cuppa before you start!! I never actually planned to run a marathon this year. With everything that is going on in my life right now, I knew committing to a marathon would possible be a step too far, but then in November some crazy editor from a proper running mag (sorry Rich) said to me “don’t suppose you want 5 spaces for London do ya?” it took me all of a couple of hours to decide I did, and within a few days I’d found 4 other crazy ladies (2 who had never run a marathon before) to join me. Of course I had been running over the Autumn, but no real distance and not as regular as I would have liked, so in January I started to knuckle down with the help of Jantastic, I started going to the gym and swimming twice a week too…I wanted to give this marathon a good shot, and perhaps even beat my 5.50 time from 2012. But then as we headed closer towards April I started skipping the odd training session as the business started to grow and childcare became a bit of an issue…at one point I was doing no evening or weekend runs and having to run between meetings while my daughter was at nursery…turning up red and sweaty to a meeting at the Royal Festival Hall was funny…although I was meeting a colleague from England Athletics so they could hardly complain. I did manage the occasional track session too with East London Runners…but I wondered what with my recent ITV gig if they thought my absence from club runs was a sign I was getting too big for my boots. 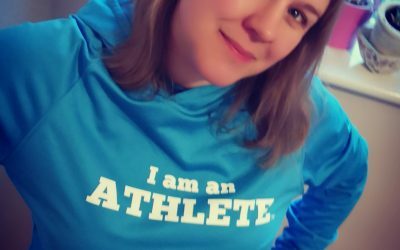 I did a couple of half marathons, a few 16 milers (one consisting of 5 hours in the rain and wind) and then I did a very slow 20 miles on Easter Sunday…so I was kind of on track still….but then this…. 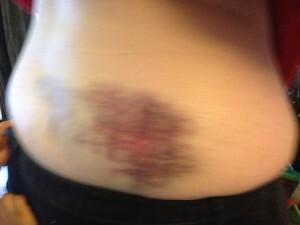 I managed to fall down a flight of stairs on a bus when it pulled off quickly. I knocked my head and my back and was unconscious for a few minutes before having to go to A&E with severe back and neck pain. The following week was a blur…a real blur. I had concussion and struggled to talk..think…remember…yeeeessshhh, all I could think about was what to do about London. Of course I could have pulled out…some of you will be thinking I should have done, but a week later I was feeling much better and after a number of sessions with my Osteopath (hey Camilla) I was feeling a lot better and decided I would get myself to the start line (with a mile of Rock Tape holding me together) and simply see what happened. On race morning I felt pretty good…I’d had a good breakfast, had all the right kit on and my legs felt fresh as I hadn’t run in about 20 days, so I kept myself busy at the start line supporting the 4 ladies in my Too Fat to Run team, being interviewed by BBCs Helen Skelton and hopping around in pen 9 to keep warm. 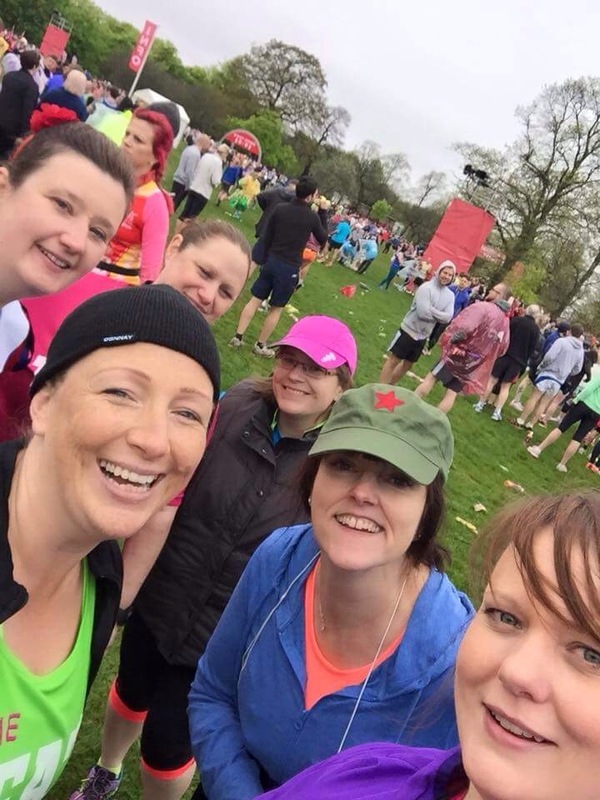 The plan was to run together for the first mile and then it was every women for herself. I’m not very good at running with others and I didn’t want the pressure of having to run faster or slower so I assumed I would run most of the event by myself, how wrong could I be. 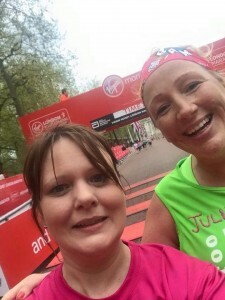 Eva and Sara were gone almost as soon as we were past the 1 mile mark, and somehow we had managed to lose Tracey but it seemed like Jo and I were running at a similar steady pace so we stuck together…we didn’t really discuss it, it just happened. We reached the 5K point in 37 minutes..not the fastest time but considering the crowds not too bad. We got to 10K in 1.19…I was feeling OK…I had a strange pain in my foot but my neck and back were holding up. We stopped for a loo break in a restaurant and then headed towards Surrey Quays and Bermondsey where we were expecting to see loved ones. The atmosphere was great and lots of other runners were asking me for selfies, or telling me they read the blog which was a real boost, taking our minds off the rather dull backstreets…then I spotted my mum and sister. I wasn’t expecting to see them as I’d run straight passed them in 2012…ten minutes later I spotted Rose and her Dad…then Joanne spotted her family. It was nice to actually stop and speak to our loved ones rather than just speeding past them like I have in previous years, we had been keeping an eye on the 6 hour pacing bracelet on my wrist as a guide but we were both clear that finishing was the goal. Jo’s training had been frustrating. 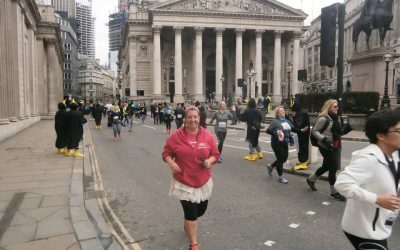 She had picked up a recurring foot injury and a half marathon a few weeks ago was the longest run she had managed in preparation, so in many ways we had both arrived at the start line in the same frame of mind…but now we were approaching Tower Bridge…we were nearly half way round. 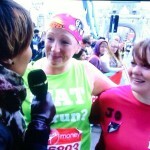 Running across the bridge was a huge moment…being interviewed by Denise Lewis was even bigger. So many years growing up I had watched people being interviewed on that bridge as part of the BBCs coverage, all those inspiring stories and now thousands of people would hear about my mission. Loads of people around the route were pointing at me and shouting “saw you on the tele”…and my vest was doing its job and engaging spectators and runners alike. There were a lot of walkers by this point, but my Too Fat to Run? vest made it quite easy for me to keep running…the slogan is ironic while you are running…but not so much whilst walking. 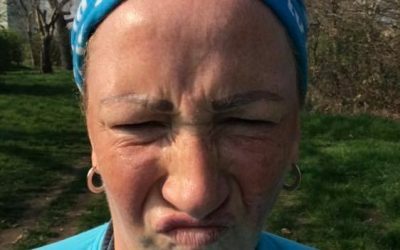 At mile 14 we both needed the loo again and we ended up queuing for almost 30 minutes which was annoying…but it did give us a chance to stretch and I almost forced Jo to take on a gel…she had been surviving on jelly beans…but by now it was like 5 or 6 hours since breakfast. The next few miles through isle of dogs were done using a run walk strategy…often running when there were big crowds or mile markers and power walking the quieter bits. By this point Tracey had managed to catch us…she was power walking now due to a bad knee…but she was on a mission, I’ve never seen someone so determined. We were most definitely at the back end of the marathon by now, so Canary Wharf was very quiet in terms of crowds and by the time we reached mile 20 where my running club man the water station there were only a handful of them left, but Rose was there again to greet me, and her dad handed us a donut to share…it was great to have something other than sweets. We were doing less and less running now, but still trying to start ahead of the dreaded sweeper van. there were men lining the street waiting to clear up the roads and collect up the fencing and the weather was getting colder in fact there were few runners at all around us now, and with all the limping walkers and people wrapped in space foil it looked like the fall out of a disaster…but I was determined not to get disheartened by it all, so I tried to keep us motivated to get under the 7 hour mark and convinced Jo to run as often as she could manage…I could only manage bursts of 2 or 3 minutes but I used the crowds to spur me on, especially past the cheers at Mile 21 (Cheer Dem Crew never fail to disappoint). We passed Big Ben and knew it wouldn’t be long now. 600 meters to go and we had a selfie and then came the mall. As we turned the corner we took one last big breath held hands and headed towards the finish line crossing it hand in hand…we had finished just shy of 7 hours, 6.54.50 in fact, but ultimately just happy to have made it round without incident. In every long distance race you run you learn something new about yourself and this one I think has been the most poignant, especially on the 35th anniversary, so when I look at that medal and its iconic image of Chris Brasher and John Disley finishing hand in hand I think I have finally realised what marathon running is all about…and it isn’t ME!! 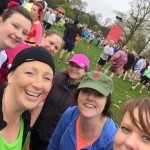 It’s not about how I found it, how much running I did…or what time I finished in…its about all those collective shared memories, the things we laughed at, the generosity of complete strangers (the lady with the cocktail sausages for example) and the thousands of spectators who added to the atmosphere. 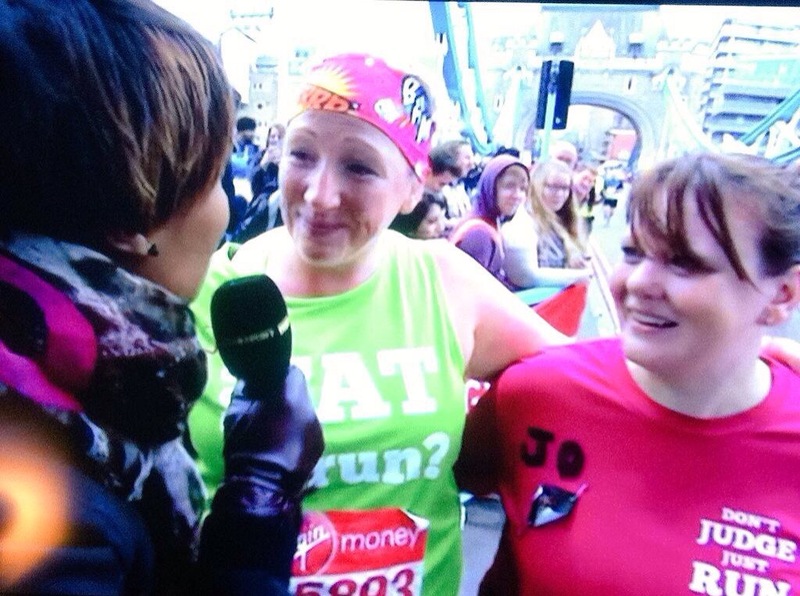 Some people might think that I got Jo round the course, but if truth me know Jo got me round. She helped me switch off the voices in my head, my ridiculous competitive streak and my tendency to dissect everything and convince myself I could have done better. 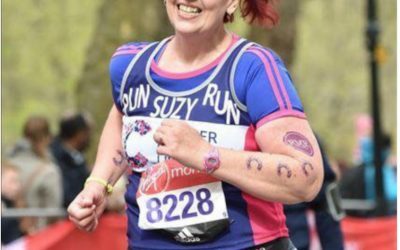 I don’t know if I will ever run another marathon but I will never forget London 2015…the year I realised that marathon running is not all about me! !